Why Choose the African-American Experience Program? An undergraduate certificate program offered collaboratively by the College of Liberal Arts and the College of Education and Human Services. The purpose is to provide students in the College of Education and Human Services whose professional goals include teaching in urban settings with the opportunity to study the history and experiences of African Americans. Satisfactory completion of this study will give students knowledge of how distinctive social, educational, economic, familial, and racial dynamics shaping the world views and struggles of urban-located African Americans impact public education in the inner cities. It is commonly recognized that urban education has its own unique characteristics and demands, shaped by a variety of both historical and present day socio-political and racial realities. The problem is that teachers teaching in these environments--especially those not raised in them--often have little or no knowledge of these realities and hence sometimes easily misunderstand the unique kinds of academic challenges and needs that they impose on students in terms of their views of and desires for learning. Absences of understanding the “special needs” of students can often undercut a teacher’s ability to effectively communicate with and teach students. Moreover, it can work against a teacher’s efforts to communicate with parents and secure their support for helping educate their children. In an era when new strategies are needed for tackling the myriad of problems facing urban education, there is a clear need for teachers to have a foundation in the unique history, struggles, and needs of inner-city students. The College of Education and Human Services is committed to preparing professionals to meet the needs of a diverse, democratic society. 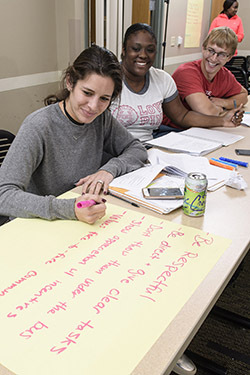 This certificate program--specifically designed for students interested in teaching in inner-city environments and focused directly on the needs, world views, styles, hopes, and dreams of the African American community--complements this mission and significantly extends efforts to prepare teacher candidates to work effectively with diverse student populations.